When I was 14-years-old, candidates for the 2008 presidential election began campaigning in the Bay Area. I was a freshman in high school, a reporter for the school newspaper, and wanted to photograph and interview the candidates alongside the presidential press. Everyone told me not even all the internationally established press would get credentials. That never stopped me — even without connections. Then at age 16 I decided I wanted credentials for the presidential election. Just like before, people told me that was crazy and would never happen. Again, I continued to hustle. It worked. My press credentials for the Presidential Inauguration and select other events. I was the only high school student in the country with press credentials to the Presidential Inauguration. This mindset of hustling prepared me for getting a job in tech — without even realizing it. 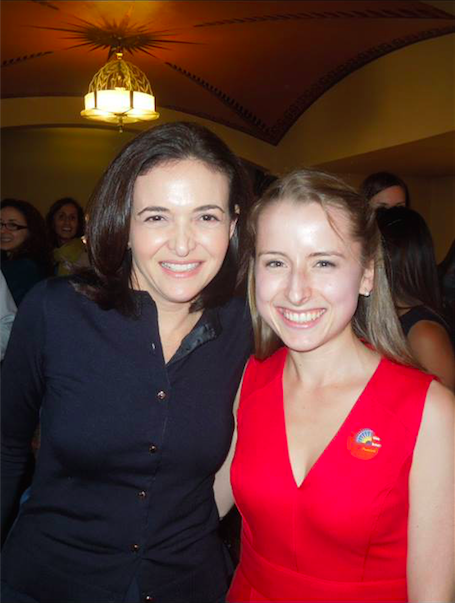 I had tickets to a talk by Sheryl Sandberg at the Commonwealth Club in May. Unfortunately I needed to stay on campus to work on thesis, and couldn’t fly home to San Francisco to attend. I posted the tickets for sale on Craigslist, and searched everyone who emailed me on Linkedln. I sold them to the lady I wanted to meet the most, who leads Business Development for Sosh. 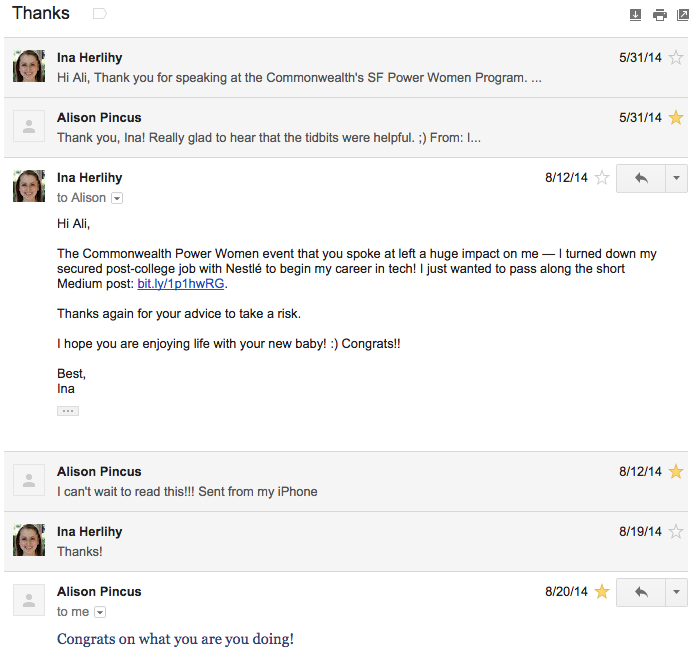 Months later I recommended a new friend for an unposted job at Sosh — where she now works. I made an executive decision to begin my career in tech. I had recently graduated from Scripps College with a degree in economics and Mandarin, and told Nestlé I wasn’t going to Bloomington, Illinois to begin their 3.5 year finance rotation program. While browsing Twitter I discovered Tradecraft, a three month program preparing people for traction roles (now engineering too) at high-growth startups. I enrolled to learn growth marketing, but discovered the most valuable aspect of Tradecraft is the network — especially for those like myself with no industry experience or connections. My list consisted of over 100 companies from seed-stage to late rounds, from only the founder to over 300 employees, and from SF to NYC to London — and many in between. I read TechCrunch religiously every morning, and throughout the day also checked Gigaom, VentureBeat, Techmeme, and Wired. I wanted to learn about new startups, recent funding, and product developments — for general knowledge and to help augment my career funnel. The great articles I read, I posted (and still post!) on Quibb. I use it as a platform to save past articles I’ve liked, share them with others, and discover new articles from those I’m following. At Saturday’s YC Female Founders Conference, Mattermark CEO Danielle Morrill mentioned her vision to build the Bloomberg for startup investors. Little did she know Mattermark would quickly have a much broader application! She recently blogged about the discovery. My company list was very diverse, and I was debating joining a startup as the first marketing hire, or joining a more established startup. I met with folks on both ends of the spectrum to ask questions, and discover where I fit best. I took advantage of time at Tradecraft before morning class, and semi-flexible afternoons to meet people for breakfast/lunch/coffee/fro-yo. I’ve tried to meet as many new people as I can. Studies show that broad networks are the most beneficial in finding jobs. You never know how people you meet can influence you. I wrote a blog post, How Twitter Changed My Life, about my decision to enter tech. I treated it like a personal press release of an update on my life, and sent it to several people whom I seek to emulate. Several mentors visit Tradecraft every week to share their career experiences and insights. I blogged about what Jared Fliesler, General Partner at Matrix Partners, shared at Tradecraft about his career from start-ups to venture capital — before turning 30. Despite having to sell my tickets for an event with Sheryl Sandberg months previously, I was delighted to see her on the Commonwealth Club roster again. 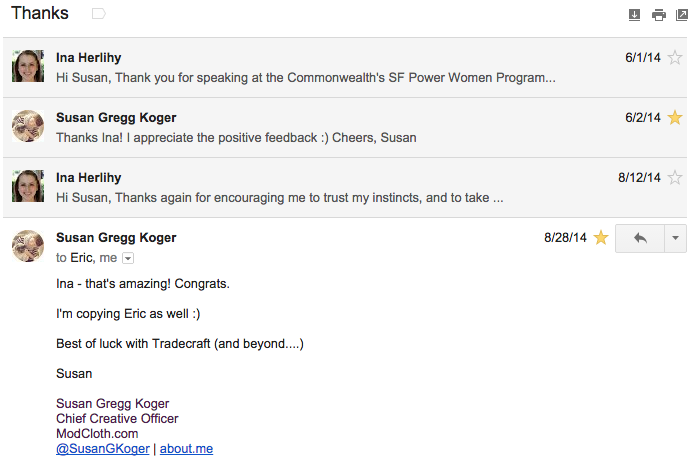 My program at Tradecraft was finishing at the end of September. I’m a workaholic, and always have to be busy. I made it my mission to have a job by my final week, so I could immediately begin my new career. I initially focused on getting a job at Shyp. I emailed Marketing Director Lauren Sherman in July, and didn’t receive a response. I emailed again in August. We scheduled to meet at the beginning of September — but then she had to cancel last minute due to a trip to NYC to help plan for Shyp’s expansion. I reached out to Shyp investor Pascal Levy-Garboua, who’s a Tradecraft mentor, to ask questions about the company. Next, I wrote a four page growth strategy for Shyp, including partnerships they should pursue, and people who I could connect them with to make it happen. I emailed the letter to CEO Kevin Gibbon. No response. So I decided to ship my letter to him via Shyp! Still no response. Kevin tweeted about co-founder Joshua Scott speaking at a Designers & Geeks event. So of course I immediately bought a ticket and showed up. Maybe Kevin wouldn’t respond to my email, but he couldn’t ignore me in person! He said he hadn’t been in the office for the last few weeks, and would forward my email to the Director of Marketing. As I expected after our interaction, I didn’t receive a response. I knew it was time for me to move on. 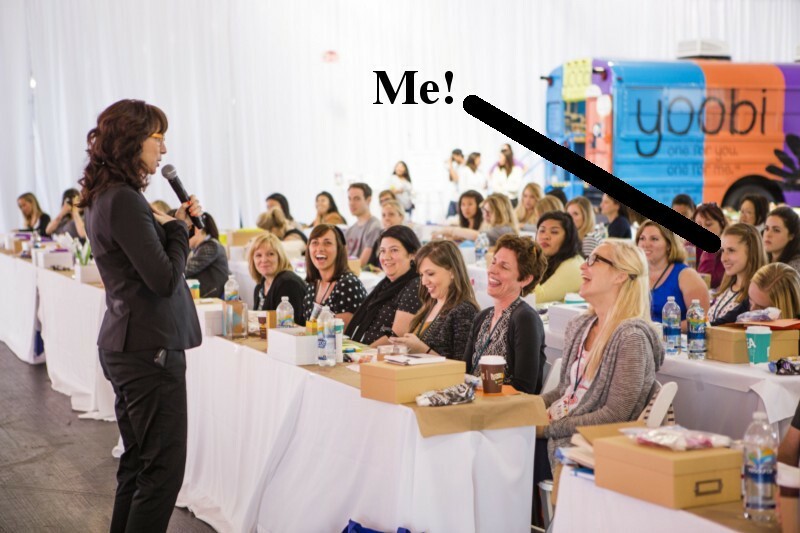 I attended the Brit+Co Re:Make Conference, because of the fabulous line-up of speakers including Brit & Co Founder Brit Morin, Eventbrite Co-Founder Julia Hartz, and Cowboy Ventures Founder Aileen Lee. I’m always inspired by these talks, and it’s especially great when women reign on stage. Dave Morin, Path co-founder and angel investor, was at the conference the whole day supporting his pregnant wife. Most conference attendees were young women, part of the maker movement, and not deeply involved with the tech scene — so they didn’t recognize him. During the end of conference happy hour, he rode around Fort Mason on his Boosted Board — until it ran out of battery. Then I took the opportunity to introduce myself and ask a few questions. Because he was waiting for Brit to finish up closing the conference, with a dead Boosted Board in hand, he kept chatting with me for three hours. He pulled out his phone, commented on each app, and shared insights from companies he has invested in & wished he invested in, investing mistakes, angel investing, specific companies I should target — and even unsolicited dating advice! Investors have access to private information, and while they don’t explicitly share it, their excitement has been correlated with TechCrunch articles published months later. While on the job hunt, I’ve found it valuable to be open to any opportunity. At the beginning of my job search, I didn’t quite know what I wanted. Growth expert Andrew Chen emailed me about potentially helping him launch his 8-week growth lecture series. It seemed like a great opportunity, but I ultimately decided I wanted a more hands on growth job to maximize my education. In August I began using Weave, “Tinder for Linkedln,” as another networking tool. One day I received a message that piqued my interest, and arranged to meet the co-founder. I decided to join 1sb on a contract-to-hire basis, after an initial coffee meeting and office visit. The founders previously founded companies acquired by Skype and Disney, so they had proven success. The team was about 10 people, and I was excited about the opportunity to work with a small team. There was one lady who recently joined the team to lead growth. She previously founded her own company, was a VC, and just an overall super smart lady who I want to emulate. They have a great culture, and everyone is super nice. Misha Chellam, one of the co-founders of Tradecraft, knew one of their investors. He reached out and received a positive review of the team. I met with Maya Grinberg, the Director of Marketing at Wealthfront. She was the first person to question my decision to join 1sb. I finished the growth track at Tradecraft Friday, September 26. I had a ticket for the Women 2.0 Conference the following Tuesday and Wednesday. So I arranged to start at 1sb on Thursday — the week after finishing Tradecraft, which was exactly what I wanted. My lunch mentor speaker canceled, and I was asked to join another table. I skimmed the conference room, recognized investor Hunter Walk, and sat at his table. Like Dave Morin, Hunter shared insights from his portfolio companies to best startups to launch a career. Interestingly enough, Dave and Hunter both mentioned the same company as their first pick. I compiled some of my favorite nuggets of wisdom gained from coffee meetings during my time at Tradecraft into a blog post: Wisdom Shared From 78 Tech Trailblazers. Soon after I began at 1sb, I realized it wasn’t a proper fit. My first day, the Head of Growth was asked to be a Product Manager, and thus my role was more in question. The company needed to focus on developing their product before having someone dedicated to growth full-time. I wasn’t learning and being challenged at the fast pace I was expecting. Although the timing wasn’t right, I met great people. Who knows how our paths may cross again. Many companies I wanted to work for didn’t have a job posted I explicitly fit. So I created my own projects to prove I could add value with my level of experience. I targeted Wealthfront. I created and prioritized a list of over 10 ideas to attract customers. I also shared my ideas with Tradecraft Growth Instructor, Graham Hunter, and co-founders Russ and Misha. One of the benefits of Tradecraft is the network to seek advice and guidance. Asked what other information they wished was presented in the chart. Asked about what strategy they’d consider. My goal was to be helpful and share a great resource with all Hubspot employees — and also have insights to share with Wealthfront. The Commonwealth Club honored Marissa Mayer with their Visionary Award, and I was excited to meet another role model. I returned to Tradecraft and helped Graham lead the growth-project for Sprig. During this time I focused on developing more technical skills, and learned more about approaching growth with a strategy and process. I focused my “free time” on the job hunt. I created personal business cards for myself, and included my Wealthfront referral code on the back. I decided to attempt the #2 project on my Wealthfront list. Wealthfront waives the management fees for the first $1 million for 501(c) organizations. My plan was to initially target non-profits in San Francisco. I assumed that many employees would have personal money they could invest once educated about the importance of investing, and the benefits of Wealthfront. When I received a response, I passed along the link to https://wealthfront.org, so the charity representatives could apply directly through Wealthfront. I had a dual step email, so I could keep track of how many people I directed to Wealthfront who applied. After sending a few dozen emails, I questioned my tactic and the time I was dedicating to it. I ended up abandoning the project, and didn’t share this work with Wealthfront — or anyone else. The next company I decided to create a project for was Nextdoor. My goal was to refer as many people as possible to Nextdoor. I focused on real estate agents, because I assumed they would be easiest and fastest to convince to sign up. My next planned project was to recruit police officers, firemen (and women), and emergency service people. I knew Sarah Leary, Nextdoor Co-founder and Vice President of Marketing, especially cared about targeting this group to join the platform. I just wanted to first quickly recruit others in bulk, and optimize my emails. In my emails I introduced myself as a supporter of Nextdoor, briefly described the platform and how they could benefit by joining the community. I varied my emails by subject line, length of email, content, and formatting — ultimately sending six different versions. People weren’t accepting my emails as fast as I expected, so I decided to pivot to another referral idea: Facebook messages. I sent personalized messages to many of my 1,296 Facebook friends, and tried to reference stories or ask about school/work/life. I analyzed over 15 start-up referral programs and landing pages, and wrote a blog post: How to Optimize Referral Programs. I sent the link to companies I cited, other companies I thought would benefit from the insights, and Tweeted the link. The CEO of Wealthfront, Adam Nash, sent me a direct message Tweet to email him, as they had a position I might find interesting. The CEO of Postmates Tweeted at me, and several other smaller startups emailed me as well. The post was also featured in the Dec. 17 Mattermark Daily — and Tradecraft mentors and friends forwarded it to me. The Tradecraft-Sprig project ended mid-December. After I returned home from holidays in New Zealand with my dad and sister, my plan was to interview for jobs full-time. I began browsing AngelList more actively for jobs, instead of company specific job boards. I changed my profile setting to actively searching, and received several inbound messages. One company stood out from the others: Zumper. One of my lessons after my September job hunt, was I should have spent more time interviewing, and been less focused on getting a job quickly. So this time, I wanted to make sure that I continued speaking with companies, and not commit too soon. The team at Wealthfront ultimately decided that the best thing for their business was to hire someone with 5–10 years of experience. Sure, it was a bummer at the time, but I proved myself to Andy Johns, their Director of Growth & Revenue, who mentioned he’d be happy to be a reference for me, and that I was doing all the right things to break into tech. Andy introduced me to some of his friends in tech, without me asking, with the subject line: “young workhorse.” I met Amy Chang, CEO of relationship management startup Accompani, who previously led Google Analytics from 1% to over 70% of Alexa Top 1 Million sites worldwide. I also met with Accompani Product Manager Evonne Johnson, who had recently completed her Harvard MBA. Joining Accompani seemed liked a great opportunity. I thought I was just meeting Postmates CEO Bastian Lehmann for about 30 minutes for coffee, but my first visit lasted a few hours, as I was also interviewing with the Director of Growth Kristin Schaefer and Product Manager Sara Mauskopf. I Ubered straight from the Postmates HQ to the Autodesk HQ to interview with Zack Onisko, Head of Growth at Creative Market. I liked the opportunity to work under a growth expert, who could guide me so I could become an expert myself. Just 30 minutes later, I spoke over the phone with Devin O’Brien, Head of Strategic Marketing at Zumper. I became increasingly more interested in the opportunity, and in Zumper being the best place to launch my career. I interviewed with the rest of the growth team when I visited the Zumper office. Then when CEO Anthemos Georgiades entered the room, he mentioned he noticed we had a mutual connection, Nick DeWilde, who’s now leading the Tradecraft program expansion while finishing his final semester at the Stanford Graduate School of Business. Anth messaged Nick, and his response led Anth to say he didn’t have to ask me any questions. It was my time to interview him. I was struck by this, and Anth’s overall focus on maximizing my career development — to a greater extent than any other CEO/potential future boss I had met. He said if I wanted to develop management skills, he’d give me interns to manage. If I was interested in venture capital, he’d bring me to his Series B fundraising meetings. Series A company with investors including Kleiner Perkins, Andreessen Horowitz, Greylock, NEA, and CrunchFund. I would join a small team as employee #17. Twice over the summer I was considered moving, and Craigslist was the best option I could find. It was truly sub-optimal. None of the people I messaged responded, and several times postings were already rented. I knew the rental industry needed disruption. Without asking, Anth introduced me to his investor Chi-Hua Chien, co-founder of Goodwater Capital who previously led Zumper’s Series A Round at Kleiner Perkins, so I could learn his motivation for investing. We also spoke about his vision for the company, and other insights from investing over the years. This conversation cemented in my mind that I wanted to begin my career at Zumper. Although Accompani raised a $15 million Series B in November while still in Alpha, the team is still focused on developing the product — with no focus on growth for the time-being. Although my conversations with the team didn’t result in a job, I gained supporters — and hopefully rockstar mentors. Amy said she realized she was missing out by not hiring me then, and sent me some treats instead. Upon evaluating my opportunities, I ultimately decided to withdraw my candidacy at all the startups I was speaking with. I made a decision. I chose Zumper. My motto in life is that everything happens for a reason. Six months ago I wouldn’t have been able to predict where I’d end-up. By continuous hustling, you can find the perfect job — or in my case, it may find you. I’ve been fascinated by how Halo Top is worth $2 billion, after only being sold in stores for 5 years. So I’ve analyzed the $10 billion ice cream market, how Halo Top rose to success, and assess future opportunities for innovation. I analyze the aisles of grocery stores, and focus on non-alcoholic beverages: acquisitions in the space, growth opportunities for 4 verticals (water, coffee, tea, and smoothies), and specific expansion strategies. Tweet at me at @inaherlihy.